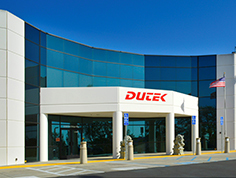 Started in 2000 by the Du family in order to serve key DDH Enterprise's customers, Dutek has been specializing in high-mix/low-volume production of turnkey and consigned, surface mount and through-hole, printed circuit board PCB assemblies. We are very competitive on price, turnaround time, and service quality; but what truly differentiates Dutek from competitors is product quality: we consistently deliver top quality products by rigorously verifying specifications prior to production, strictly adhering to our certified ISO 9001 & 13485 Quality Management Systems (QMS), and only employing a very experienced and stable workforce. Our 53,000 square foot facility located in Vista, CA, is UL certified and ITAR registered.